We've all been busy the past few weeks preparing for the much awaited Mass Immunization of Measles-Rubella and Oral Polio Vaccine this coming September. Last year, many children died of measles and when their parents were interviewed, it was found out that most of those children were not vaccinated against the said disease. 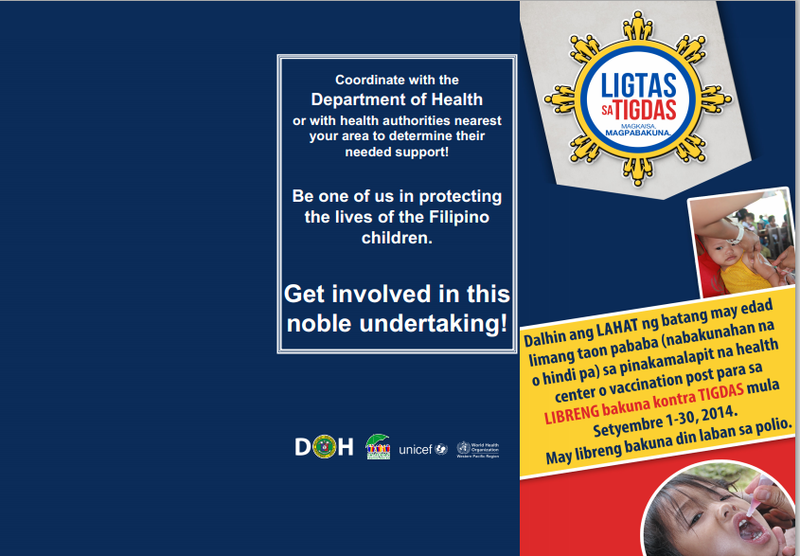 In order to address such issue and also to bring measles down to very low levels, if not totally eliminate it, DOH in cooperation with other health authorities came up with this Supplemental Immunization activity. The project also aims to reduce Rubella and help keep the Philippines polio-free. Vaccination posts will be set up on each zones of the barangay. (Ask your health workers about the schedule of your barangay.) Remember, these vaccines are FREE. Children aged 0 to 59 months should receive the vaccines whether or not they were previously vaccinated. This is a SUPPLEMENTAL activity and is supported by World Health Organization. There is no vaccine overdose anyway. In 2011, DOH had the same activity dubbed as "Iligtas sa Tigdas ang Pinas" wherein I was also a part of. We vaccinated the children on a door-to-door basis to make sure no one's left out. It is estimated that in this year's activity, 11 million children will receive the Measles-Rubella vaccine and 13 million for Oral Polio. For more information, you may visit the health center near you or post your questions down below. This is good for children and DOH have done their part to reach-out to the poor people. If the baby or child did not get measles because of protection from the vaccine, it's still possible for the person to have measles when he/she grows up? It's great that DOH is helping out. Are you one of the volunteers? If so then Thumbs up sa iyo. Joining cause-oriented events such as this is great. About polio, I thought na totally eradicate na ang polio sa Pinas. Opo Papaleng, polio has long been eradicated in the Phils. but DOH decided to give boosters to children since there are outbreaks in other countries lately. This is a good move against measles since it can be really deadly. Vaccination can save thousands of children from this deadly disease..
Good at least lahat ng mga bata ma'immunize man lang..lalo n those who are in the poverty line.Can't afford to pay for a doctor. God Bless our DOH! Finally there's hope that the government's actually using the taxes I pay for something good. Yes, let's raise awareness on prevention of measles and pollio as prevention is always more important than cure. This is a great campaign to help raise awareness and prevent the onset of measles. THis is good news. I had measles months ago. :( The doctor ordered me not to go to work for 5 days and I was like.. =| =] =D Okay! But really, measles vaccines should be distributed. This is a very timely reminder for parents who need to have their children immunized for measles. Tanong ko lang po if ano ang composition ng measles rubilla opv and that polio oral vaccine? Kasi ngka allergy anak ko. I need to know ano meron dun bakit sya ngka allergy. Reaction kaya ng katawan nya sa vaccine? Hi! Your child's allergy is probably due to measles component of the MR vaccine. For more info you may read: http://www.cdc.gov/vaccines/hcp/vis/vis-statements/mmr.html or better yet, consult your doctor. hi mam, ask ko lang twice po na inject ng oral polio vaccine at measles-rubella yung anak ko 1 day lang ang pagitan. Dinala ko sya sa center the other day. Tas ngaun bago sya umuwi from school sinabi ng teacher nya na pina inject mga bata ksama ung anak ko. My possibility po ba ng overdose? if ever anong kaylangan kong gawin. Thank you.